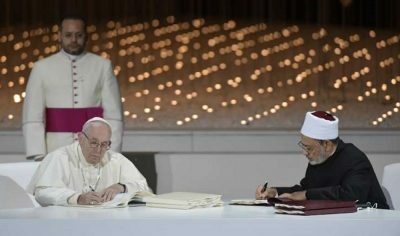 Pope Francis and Great Imam of Al-Azhar sign Document on Human Fraternity affirming brotherhood of all men and women and condemning every form of violence, especially those “clothed with religious motivations”. Pope Francis and Ahmed el-Tayeb, Great Imam of al-Azhar, sign a joint declaration on human fraternity during an interreligious meeting in Abu Dhabi, UAE, 4 Feb 2019. Credit: Vatican Media. At the General Audience on Wednesday Pope Francis assessed his recent three-day trip to the United Arab Emirates, which began on 3 February, referring in particular to the Document on Human Fraternity which he signed together with the Great Imam of Al-Azhar, “in which together we affirm the common vocation of all men and women to be brothers, in as much as sons and daughters of God; we condemn every form of violence, especially that clothed with religious motivations, and we commit ourselves to spread genuine values and peace in the world”. This document will be studied in the schools and universities of several countries, continued Pope Francis. “However, I also recommend that you read it, know it, because it gives such a spur to go on in the dialogue on human fraternity. The historic document, signed by the two leaders on Monday, calls for peace between all nations, and was signed in front of a global audience of religious leaders from Christianity, Islam, Judaism and other faiths. Pope Francis and Sheikh Ahmed al-Tayeb, the head of Sunni Islam’s most prestigious seat of learning, arrived hand in hand at the ceremony in Abu Dhabi in a symbol of interfaith fraternity. In the eight-page document, the two leaders call upon themselves, “upon the leaders of the world as well as the architects of international policy and world economy, to work strenuously to spread the culture of tolerance and of living together in peace; to intervene at the earliest opportunity to stop the shedding of innocent blood and bring an end to wars, conflicts, environmental decay and the moral and cultural decline that the world is presently experiencing. The declaration calls for the protection of places of worship – synagogues, churches and mosques – a cessation of financing weapons used by terrorist movements, the recognition of the rights of women to education and employment and their freedom to exercise political rights, the protection of the fundamental rights of children to grow up in a family environment, and the protection of the rights of the elderly, the weak, and the disabled. Addressing journalists on his return from the UAE, Pope Francis said that the Document on Human Fraternity was done in the “spirit of Vatican II”.